Hip Hops: Why Should I Buy A Replica That Isn't Actually The Team Jersey? Why Should I Buy A Replica That Isn't Actually The Team Jersey? With the release of the new Wizards uniforms, came the addition of new jerseys to the Wizards store. You can buy the classic cheap-0 replica jersey for around $45, or you can shell out the $80 for the "Swingman" jersey. The swingman is pictured on the left, and the replica on the right. Notice anything different? How about a MISSING STRIPE?! Why would I want to buy a jersey that is not actually the real jersey? This is insane. 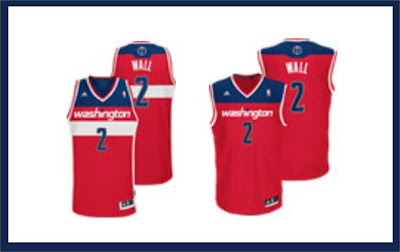 Looking through other NBA stores I don't see any team that removes a giant part of the uniform like the Wizards did. So is the idea to make people pay the extra money for the REAL version, or does adding a white stripe have certain costs that affect profitibility? For some reason I think the answer is A.